Every day we organize snowmobiles quided tours. For beginers, for all, with english quide. 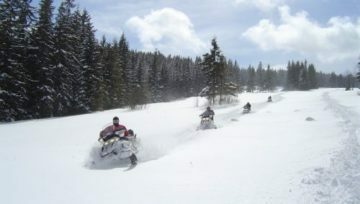 Snowdoo – since 2006 we have been organizing snowmobile tours in Zakopane and integration events for groups. Every year hundreds of individual people and several dozens of companies and corporations have the use of our services. In winter season every day we organize snowmobile excursions in form of snow safari. Winter gives great possibilities of fun, adventure and guarantees a lot of impressions for everyone. We are ready to arrange closed-circle tours and huge winter events in mountains. We are inviting to partnership and to enjoying our services. Snowdoo offer includes winter attractions: snowmobiles, integration parties, events, attractions for groups and kids in Zakopane, recreation and entertainment in Zakopane. Every year we attend several dozen of events for companies from every branch. In winter we invite groups of kids and youth for who we have prepared activities programs and attractions on snow. Snowmobiles are unusual offer and tourist attraction in Zakopane for organized groups and individual tourists. Since this year we invite also for snowshoes trips. Life time expierance on the snow mobiles. Our instructor (pietru) who loves the maltese people was very friendly and took very good care of us. Definatly recomanded !!! Had an awesome time and would definitely reccomened. At first we intended to go on a snowmobile trip but due to less snow than expected this wasn't possible and they arranged everything last minute to go on a quadbike instead. We saw the real beauty of the forests in Zakopane and had a great adventure aswell. The best in Zakopane. It was an amazing experience with amazing views of mountains thanks to snowdoo. We had a great instructor Stan that was very handful. Our base is on top of Gubałówka - Butorowy Wierch ul. Droga Zubka 40, Zakopane. Head left from the Gubałówka railway station.